the first floor), plus a powder room, assure privacy and comfort for a crowd. Screened-in porch takes on new meaning when it includes a pool, spa and lounging area and opens to an extravagant covered entertaining space where an outdoor kitchen with copper hood over the gas grill, wet bar, stone fireplace, bistro-style seating, bar counter and pecky cypress beams entice an outdoor lifestyle of ease and serenity. The pool has been converted to saltwater, and the fabulous view sweeps across the 18th hole of Burnt Pine to the 11th at The Raven. Of functional note are two tankless water heaters, security system, built-in hurricane shutters, central vacuum and smart home technology. Your home will maintain the temperature you desire with three HVAC systems. Two stories couldn’t be easier to enjoy with an elevator to access the second floor. Residing on the golf course on nearly three quarters of an acre, this home maintains a blissful privacy of lifestyle and investment value. 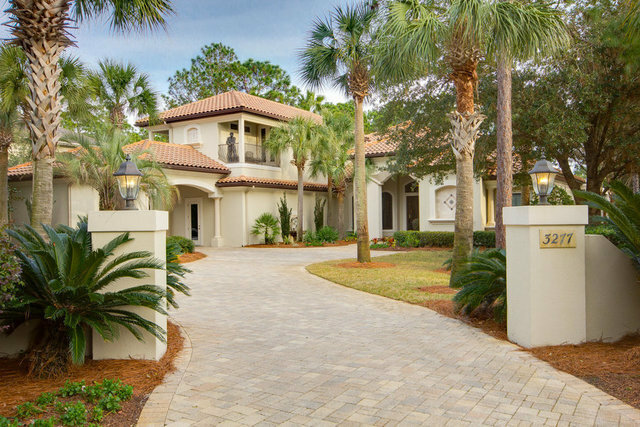 The gated community of Burnt Pine is the most prestigious community in the Sandestin Golf and Resort, a major destination for all seasons and all ages and named the #1 resort on Florida's Emerald Coast. This magical 2,400-acre resort is comprised of over 70 unique neighborhoods of condominiums, villas, town homes, and estates. The Resort features more than seven miles of beaches and pristine bay front, four championship golf courses, a world-class tennis center with 15 courts, 19 swimming pools, a 113-slip marina, a fully equipped and professionally staffed fitness center and spa, meeting spaces and The Village of Baytowne Wharf, a charming pedestrian village with events, shopping, dining, family entertainment and nightlife. For true golf cart community living, Grand Boulevard is just outside the resort gates and provides access to additional shopping, dining and entertainment all without traveling on Hwy. 98.